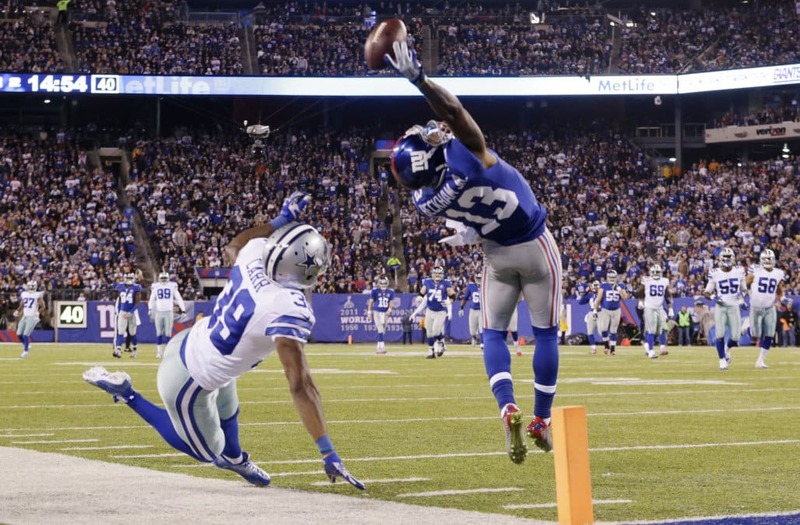 Home > US Sports > NFL > Did Beckham Jr Score the Greatest Touchdown in NFL History? Was it the greatest touchdown in NFL history? This is Odell Beckham Jr’s stunning one-handed catch to score a touchdown for the New York Giants against NFL rivals the Dallas Cowboys on Sunday night at the MetLife stadium. I was not enough save the Giants losing the game 31-28 but since that touchdown it has set social media alight with everyone talking about this unbelievable catch. It happened at the start of the second quarter after Eli Manning had let fly with a 50 yard throw up field. Beckham tiptoed down the right being grabbed, shoved and spun sideways by Dallas defender Brandon Carr. The 22-year-old’s stunning grab may have been in vain, but the rookie has got the whole of the National Football League, and the rest of the world, talking about his amazing athleticism. Beckham leaps, catches the ball with one hand, twists himself sideways, stays in bounds, and lands in the end zone. Simply flawless. “I haven’t really seen it yet. I saw it on the replays,” said Beckham, who finished with 10 catches for 146 yards. Beckham Jr finished the game with ten catches, 146 yards and two touchdowns but it wasn’t enough to lead his team to victory with Dez Bryant scoring a last-minute touchdown to win it for the Dallas Cowboys. My Goodness…. That young man is bad!!!! Man I just witnessed the greatest catch ever possibly by Odell Beckham Jr! WOW!!!! Is “Fight” What This Team Needs?